We use Swift's pointer APIs to read a text file and split it into lines without using Swift's collection and string types. 00:06 Today we'll have some fun with Swift's pointer APIs. We generally only have to deal with pointers when working with C libraries, though in some special cases, we might want to use them for the raw performance. 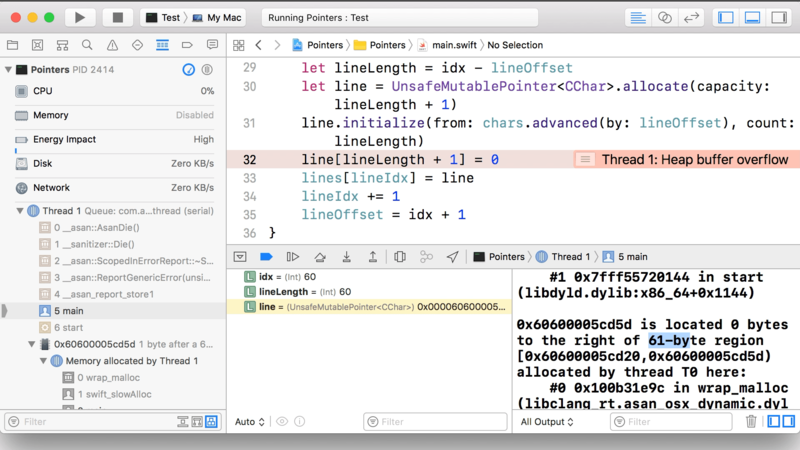 As an exercise to see what working with pointers looks like, we're going to read data from a text file and split the text into lines, all without using Swift arrays or strings. 01:48 That was super easy in Swift. Now we'll do the same thing using only pointers and C functions. 07:09 We want to end up with something like an array of strings. In C terms, that means a pointer to pointers of CChar. To construct this outer pointer, we need to find out how big it should be — how many lines there are — which we do in two steps. First we iterate over the entire string and count the number of lines, and then we allocate a pointer for each line. 07:40 Compare this procedure to working with a Swift array, where we'd normally create an empty array and then append lines to it. The difference is that now we don't have the ability to append, so we have to create an array with a certain size upfront and subsequently assign values to the array's elements. This is basically what we're doing, but with pointers instead of arrays and strings. 09:35 We could've written the same thing with filter and count, but those aren't allowed in today's challenge. 19:32 That was way more work than the two lines of the Swift example, but it's cool we can do this low-level stuff. And we could go even lower if we wanted with malloc. 19:57 Swift gives us many different levels of abstraction, and it's up to us as developers to decide what to use. The lowest level we saw today was that of untyped pointer APIs like UnsafeRawPointer, which doesn't offer any information about what's stored in its buffer. We also worked with UnsafeMutablePointer, which is typed. On top of that, a wrapper like UnsafeBufferPointer adds collection conformance by storing a count, which makes it easy to iterate over the pointer's buffer. We could've very well used these pointers and it would've made things much easier. 21:25 Here, Xcode tells us the address we're trying to write to is located next to a 61-byte region. We also see that the current line length is 60. If we add one for the terminating zero, we can figure out that we're trying to write immediately to the right of the line's buffer. This is very useful information for tracking down mistakes, especially if you're not used to writing this kind of code. 22:13 And that's probably enough of pointers for today!